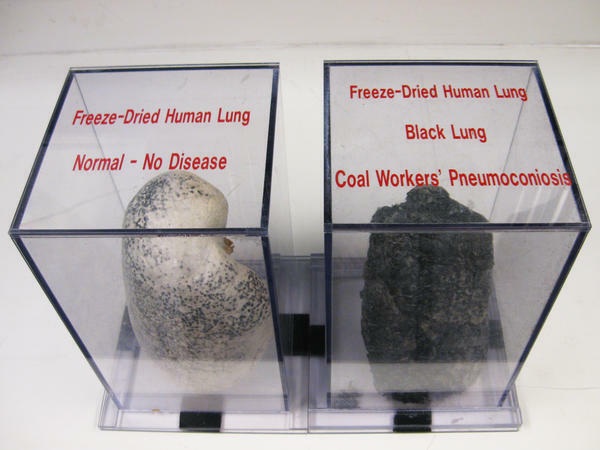 A display case at NIOSH shows a normal lung and a diseased black lung, caused by inhaling coal dust and other harmful particles while coal mining. Sliced sections of lungs show the damage and disease caused by excessive exposure to coal and silica dust. The middle slide depicts a lung with fibrotic tissue resulting from simple coal workers' pneumoconiosis or black lung. The slide on the right shows hardened and blackened lung tissue when black lung disease reaches its most advanced stage. NPR's ongoing investigation of the advanced stage of the fatal lung disease that afflicts coal miners has identified an additional 1,000 cases in Appalachia. That brings the NPR count of progressive massive fibrosis, the most serious stage of the disease known as black lung, to nearly 2,000 cases in the region, all of which were diagnosed since 2010. In the same period, researchers at the National Institute for Occupational Safety and Health reported just 99 cases nationwide. NPR's count is now 20 times what had been considered the official tally of the advanced stage of disease. NPR contacted black lung clinics, physicians and attorneys across the country. Seventeen in Ohio, Pennsylvania, West Virginia, Virginia and Kentucky provided data. Their diagnoses of advanced disease have not been independently confirmed. But the actual occurrence of disease is likely higher because many clinics across the region and the country were unable to provide data and because others didn't have data for the full 2010-16 time period. NIOSH is surveying clinics and has also found astonishing rates of disease, according to epidemiologist Scott Laney. "There's a great deal of evidence ... that definitively demonstrates that we are in the midst of an epidemic of black lung disease in central Appalachia," Laney said Thursday in Morgantown, W.Va., during a presentation before a National Academy of Sciences committee investigating efforts to control the coal mine dust that causes the disease. Laney and a team of NIOSH epidemiologists have reviewed medical records and diagnostic X-rays at four clinics in Kentucky and Virginia and are continuing to approach clinics so that they can get an accurate count of PMF cases. As part of that effort, Laney addressed an auditorium filled with coal miners, medical students, physicians and attorneys in Pikeville, Ky., in April. "If we come to your town, there's generally something bad going on there," Laney told the crowd. "We're at the epicenter of one of the largest industrial medicine disasters that the United States has ever seen." So far, Laney's team has published one study focused on a single clinic in Kentucky, reporting 60 cases there of advanced black lung. Laney declined to reveal specific findings at other clinics until a new study is published in a peer-reviewed journal. Researchers at the University of Illinois at Chicago are also conducting an independent study of the spike in advanced black lung. Black lung results from exposure to coal dust. PMF is an especially aggressive form of the disease blamed on inhalation of silica dust, which results from the cutting of quartz rock and coal together. Laney's grim assessment Thursday at the NAS committee meeting was preceded by a much sunnier presentation from a federal regulator about the efforts to control coal mine dust. Gregory Meikle of the federal Mine Safety and Health Administration said 99 percent of mining companies were complying with new and tougher dust exposure limits and more rigorous requirements for detecting dangerous levels of dust. "The compliance rates are very impressive," Meikle said. "It's meeting the objective." Meikle also acknowledged that black lung can take a decade or more to be detected or show symptoms. "Have we eliminated the disease?" he asked. "That's a question and we won't know. But if we wait until we do know, it'll be too late to do anything about it. So we continue to look and analyze and work." But Laney said the mining industry's compliance record has been high for at least a decade. There wouldn't be as much advanced black lung disease now, he suggested, if the compliance rates accurately reflected actual exposure to the coal and silica dust that cause advanced disease. "I don't think there's any reason for me to believe that there's any exposure measurements on the books that can account for that level of impairment," Laney said. A spokesman for the National Mining Association, the industry's main lobbying group, said there was no one available to comment. Members of Congress have also expressed concern about the spike in disease. NIOSH, the Labor Department and the Department of Health and Human Services have responded with pledges to work together to get an accurate count of PMF cases and to assess the impact of more severe cases on the federal Black Lung Disability Trust Fund, which provides medical and wage replacement benefits to miners disabled by black lung. Congress also recently provided the first budget increase for federally-funded black lung clinics in five years. Those clinics across Appalachia report a growing flow of sick miners. In just three clinics in Virginia in the last four months, 84 miners were diagnosed with advanced black lung. 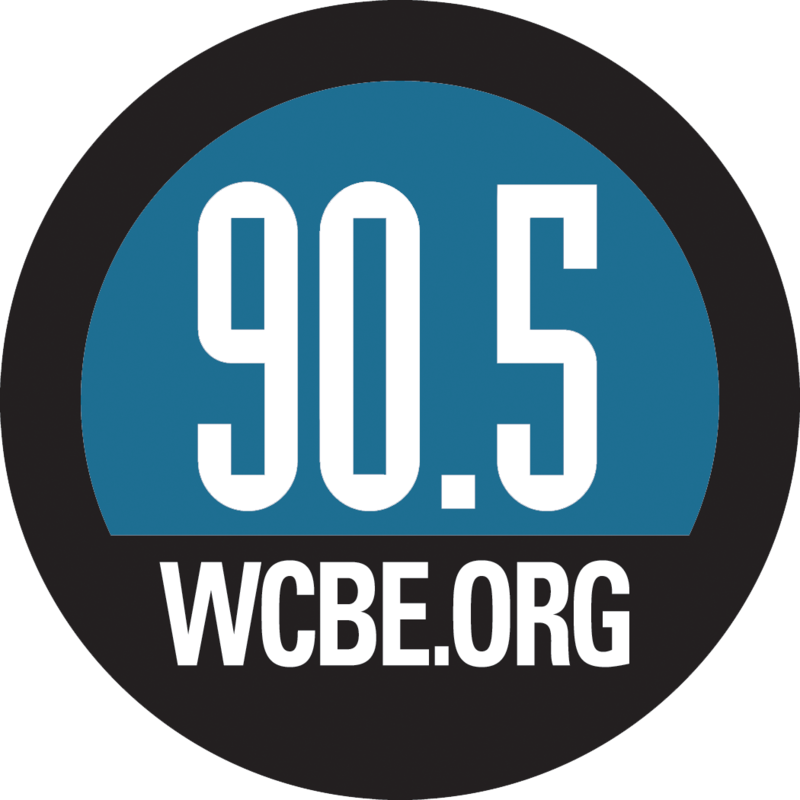 West Virginia Public Broadcasting and Ohio Valley ReSource contributed to this story.